R3 1KW/10W (for biggest force in the exit you replace with short-circuit). T3 Inductor with core ferrite (externally it resembles with small transformer but has a turn only). S1 Main switch of catering. S2 Switch of catering of rise (him we close after zestacej' the thread). With the C2 we regulate the frequency. With the C1 we adapt the resistance of aerial (practically him we regulate so that it is heard our voice in the radio as long as you become cleaner). The catering better it does not become at straight line from the network 220V but via transformer 220V/220V of isolation and safety 1A. When does not exist the R3, the force of expense is bigger, but respectively is increased also the hum 50Hz, because the simplicity of designing. The control (Audio In) can become from a kasseto'fwno or other powerful source. 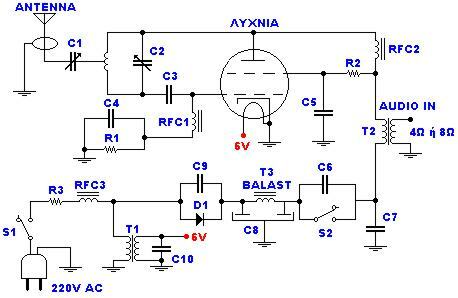 If it is microphone it will be supposed precedes amplifier so that it acquires a force of order of 8W roughly.